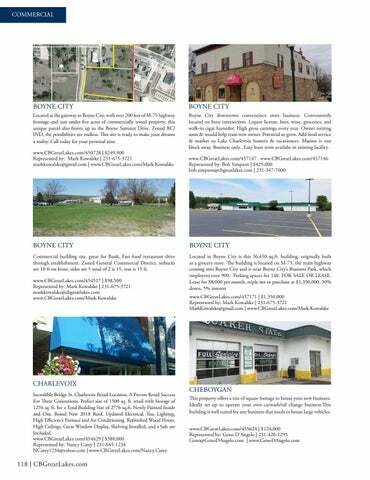 Located at the gateway to Boyne City, with over 200 feet of M-75 highway frontage and just under five acres of commercially zoned property, this unique parcel also fronts up to the Boyne Summit Drive. Zoned RC/ IND, the possibilities are endless. This site is ready to make your dreams a reality. Call today for your personal tour. Boyne City downtown conveneince store business. Conveniently located on busy intersection. Liquor license, beer, wine, groceries, and walk-in cigar humidor. High gross earnings every year. Owner retiring soon & would help train new owner. Potential to grow. Add food service & market to Lake Charlevoix boaters & vacationers. Marina is one block away. Business only...Easy lease term availabe in existing facility. Commercial building site, great for Bank, Fast food restaurant drive through establishment. Zoned General Commercial District, setbacks are 10 ft on front, sides are 5 total of 2 is 15, rear is 15 ft.